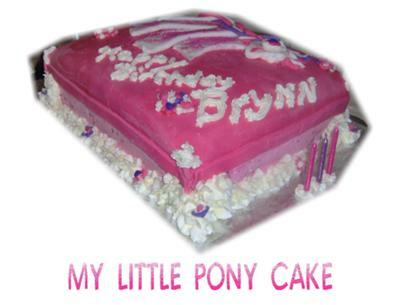 To make this my little pony cake, I made two 9x13 confetti cakes and filled them with white vanilla confetti filling. I iced them with vanilla buttercream icing. I made a pink fondant top to look like a present and added a fondant white with pink sparkles for the my little pony and fondant flowers.